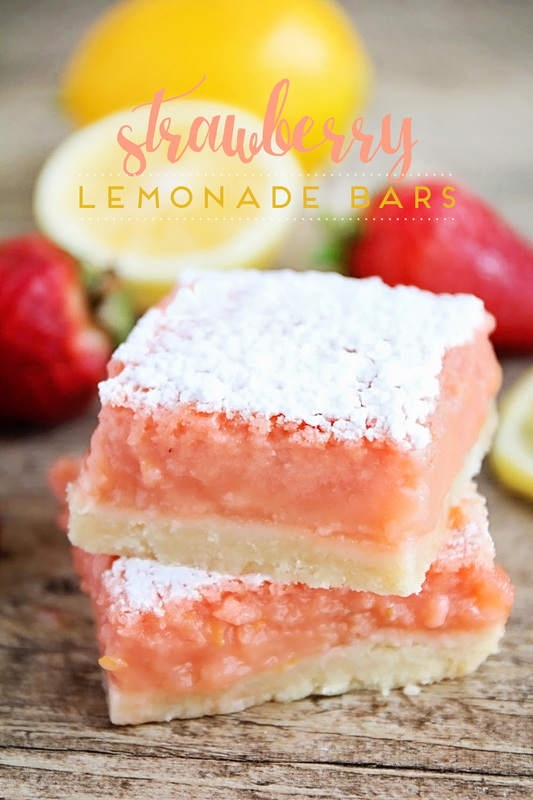 These strawberry lemonade bars are tangy and sweet and perfect for summer. 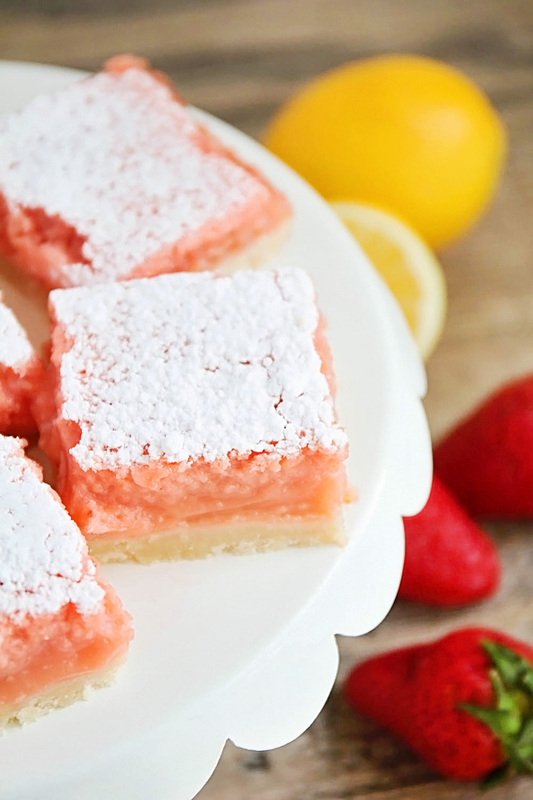 They taste just like a glass of strawberry lemonade! Did you know May is National Strawberry Month? I'm sure you know this by now if you've been reading the blog for any length of time, but we are pretty crazy about strawberries around here. During the warmer months, when they're plentiful, I buy at least one four pound container of strawberries every week, and we eat them with pretty much every meal. They're one of my favorite fruits to bake with, and we seriously can't get enough! 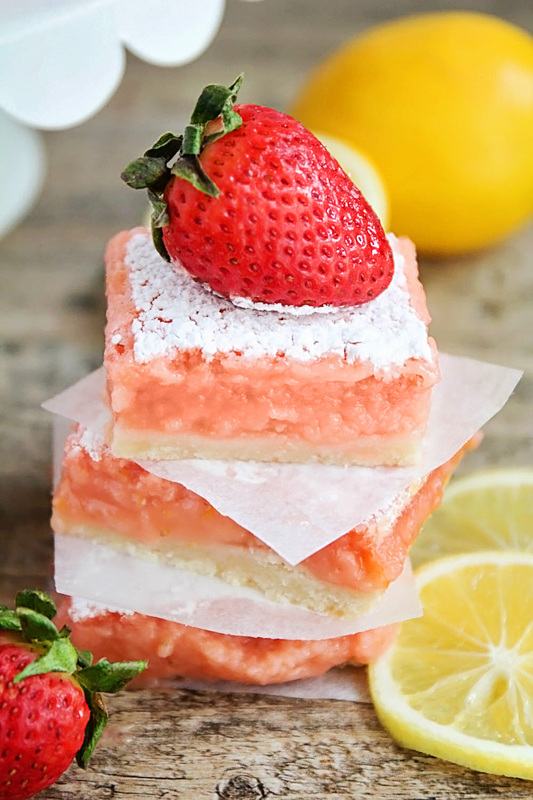 I originally made these strawberry lemonade bars several years ago, and decided it was time for some fresh pictures. I had forgotten how quick and easy these are to whip up! They have a delicious shortbread crust that's topped with a tangy and sweet strawberry lemon custard, then baked. A sprinkle of powdered sugar on top adds a little touch of sweetness and makes them extra pretty. 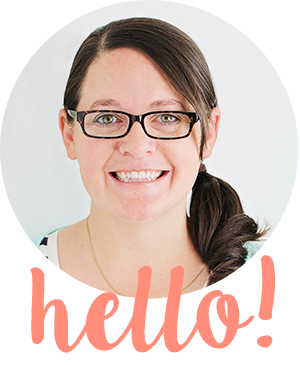 I've made these bars several times for summer parties, and they are always a hit! Preheat the oven to 350. Line a 9 x 13 pan with foil or parchment and spray with cooking spray. In a medium bowl, beat the butter and sugar together, until fluffy. Add the flour and salt and mix until a crumbly dough forms. Pat the mixture into the prepared pan, spreading in an even layer. Bake 15 minutes, or until lightly golden around the edges. While the crust is baking, in a blender or food processor, combine the lemon juice, lemon zest, strawberries, and sugar, and blend until smooth. Add the eggs and blend until smooth. Add the flour, baking powder, and salt, and blend until smooth. Pour the mixture onto the hot crust and return to the oven. Bake 22-25 minutes, or until the top looks dry and is just slightly golden. Remove from oven and let cool completely, then sprinkle with powdered sugar. 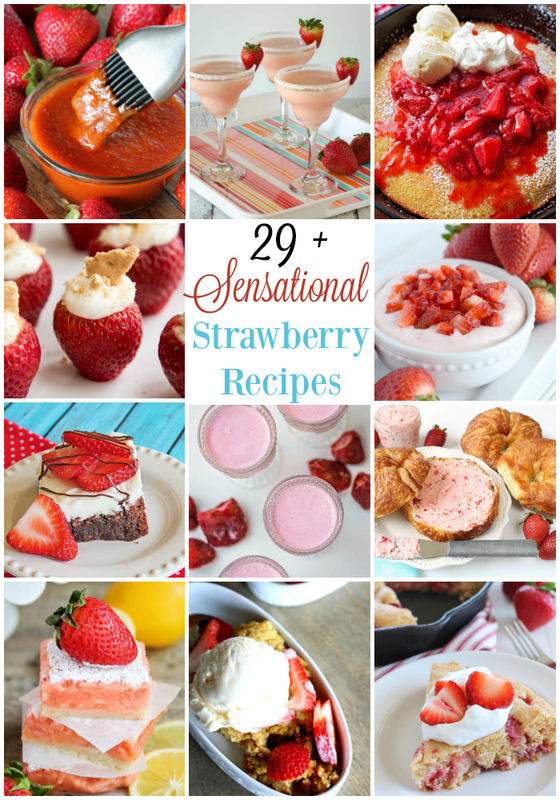 In honor of National Strawberry Month, Here are even more delicious strawberry recipes for you to enjoy! White Chocolate Strawberry Brownies from Jamie Cooks It Up! Strawberry Lemon Muffins from Jamie Cooks It Up! These are so pretty, and I bet they taste as good as they look. 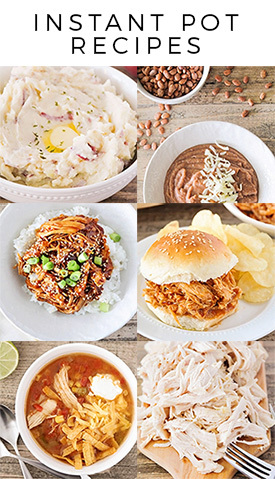 My mouth is watering!! These are beautiful and they sound SO amazing!! I love the strawberry lemon combo, so I cant wait to get my hands on these! Can I make these the day before and keep them refrigerated? Yes, but I would suggest waiting until just before serving to add the powdered sugar on top. If you put it on and then refrigerate, it kind of melts into the bars. They do keep really well in the fridge and I actually like them better when they're nice and cold. Have you tried these with blueberries instead? Could you use frozen fruit? Making these now and the filling will not set up although it's been in the oven MUCH LONGER than suggested. For those that are saying they never set, I looked up other lemon bar recipes for comparison and this recipe has double the lemon juice as others with the same amount of dry ingredients. I halved the lemon juice and they came out perfect. I also had to put a drop of pink food coloring in to get my bars that pink! I haven't made these yet, but I'm kind of wondering if the filling issues are from too much lemon juice? A cup of lemon juice is a lot. I'm going to try making these with 1/2 cup and see if that might work better.